The flax plant, which is native to the northern climates, produces fibers used to make fabrics and paper. Its seeds are for consumption by humans and livestock. You can eat flaxseeds whole, but because the body cannot digest them, whole seeds provide fewer nutrients than milled, or ground, ones. Flaxseeds also contain oil that has many nutritional benefits. Fiber is the portion of fruits, vegetables, whole grains, legumes and seeds that the enzymes in the intestines cannot break down. A 1-tablespoon serving of ground flaxseed contributes 2.2 grams of fiber toward the 14 grams you need for every 1,000 calories you consume each day. Flaxseeds contain both soluble and insoluble fiber. Soluble fiber dissolves in water, forming a gel-like substance that helps the body remove excess cholesterol from the blood. That helps to reduce the risk of heart disease. Insoluble fiber promotes a healthy digestive tract by adding bulk to stools, preventing constipation and reducing the risk of hemorrhoids. Because your body cannot produce omega-3 fatty acids, you must consume them in food sources such as fish, nuts and seeds. Both ground flaxseed and flaxseed oil contain the specific type of omega-3 fatty acid known as alpha-linolenic acid, or ALA. In fact, ALA accounts for 50 to 60 percent of the fat in flaxseeds. Omega-3 fatty acids help to reduce inflammation, increase levels of good cholesterol and reduce the risk of heart disease, according to the University of Maryland Medical Center. Whole and ground flaxseeds contain a specific type of fiber called lignan. 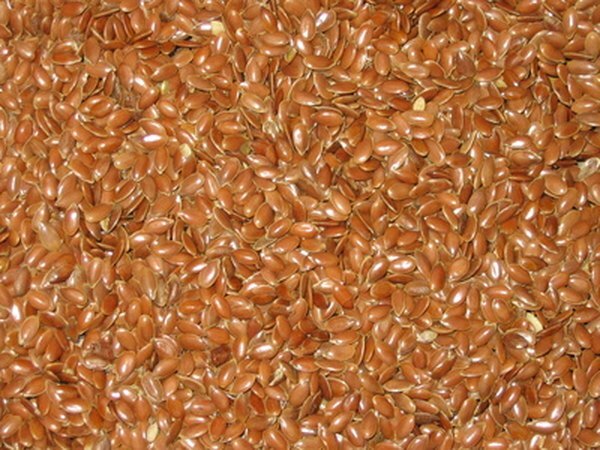 Flaxseeds serve as the richest source of lignan, providing up to 800 times more than most other vegetable sources, according to the Flax Council of Canada. Doctors classify lignan as a phytoestrogen because the body converts it into an estrogen-like substance. Lignans may help protect against certain types of cancer, but researchers continue to study this. Your body requires some fat for normal function, but knowing the different types of fat and how they impact your health is important. Unsaturated fats, including polyunsaturated and monounsaturated fats, can lower blood cholesterol levels, while saturated fats and trans fats can increase blood cholesterol levels. The American Heart Association suggests limiting your saturated fat intake to less than 7 percent of your daily calories and your trans fats to less than 1 percent. Flaxseeds and flaxseed oil contain a significant amount of fat, but more than 70 percent of that is polyunsaturated fat.